I first met Paul Conklin in West Africa over forty years ago. He was an adventurous, young free-lance photographer learning to make a living with his camera, and I was starting the first Peace Corps program in Nigeria. In 1962 Paul became a Peace Corps staff photographer, and over the next four years he visited twenty-five countries in Africa, Asia, and Latin America. Often traveling in such conveyances as old single-engine planes and dugout canoes, he took some of the best pictures ever taken of Peace Corps volunteers at work. Although we kept in touch after our Peace Corps years, it was not until 1980 that Paul and I began a writer-photographer collaboration that lasted almost two decades and resulted in twelve books. We traveled the United states many times writing about and photographing migrant farm workers, new immigrants becoming citizens, Indian refugees fleeing Guatemalan terror, and many other people that we felt Americans needed to know more about. We learned early in our work together that we cared about the same things. Paul Conklin was a quiet man who let his camera speak for him. It spoke beautifully. PORT TOWNSEND — Paul S. Conklin, the first official photographer of the Peace Corps and renowned for his ability to capture the warmth of the human spirit, has died. He was 74. Mr. Conklin, who as a freelancer shot the famous photograph of a Vietnam War protester placing a daisy in the barrel of a National Guard soldier's rifle, died Wednesday of cancer at age 74 at his home near Beckett Point west of Port Townsend. His work was featured in National Geographic, Time magazine and The New York Times, and he twice won first place at the annual White House photography exhibit, said his wife, Ruth Merryman. "Your photos proved in ways more powerful than words that we truly are all God's children and more alike than different," wrote Peace Corps founding director Sargent Shriver in a letter to Mr. Conklin on Aug. 22. 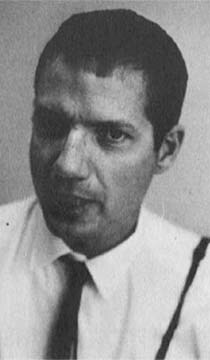 Mr. Conklin attended Wayne State University in Michigan, earned a master's degree at Columbia University and was chosen to document the Peace Corps in 1964 after the volunteer agency was formed. 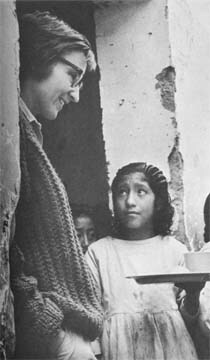 He traveled with Shriver around the world, photographing volunteers, war protesters and Third World children. Later, as a freelancer based in Washington, D.C., he collaborated with writer Brent Ashabranner on a series of juvenile nonfiction books about children of vanishing cultures and also wrote and illustrated his own books, including "Michael of Wales." His photojournalism essays on poverty in Latin American appeared frequently in U.S. Catholic magazine, including "The View from Juarez" last month. Together with his sons, David and Peter, Mr. Conklin wrote "Land of Yesterday, Land of Tomorrow," a book based on their travels through central Asia. 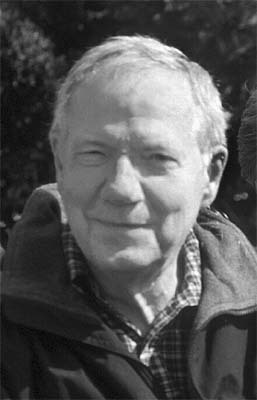 After Mr. Conklin and Merryman moved to Port Townsend in 1995 for the scenery and bird watching, he often brought his camera to community events and did volunteer photography for the police, Jefferson General Hospital, Northwest Maritime Center, the Port Townsend Film Festival and the Centrum arts and music festivals. In addition to his wife, survivors include a sister, Katherine Green of San Francisco, and a grandson. A community memorial service and photographic display is planned Oct. 12 at the USO building at Fort Worden State Park. 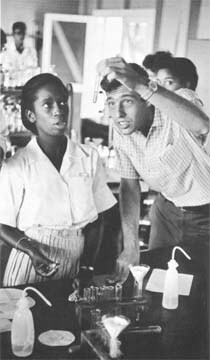 In a laboratory at Belize Tech, Andre Colpitts explains the properties of a chemical to one of his students. 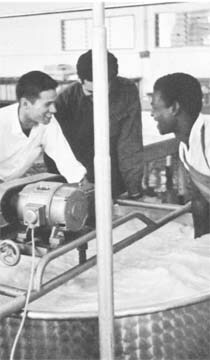 Dairy technologist David P. Hoyer (left) explains the operation of a cheese vat to Turkish Cypriot workers in a cooperative dairy plant on the outskirts of Nicosia. 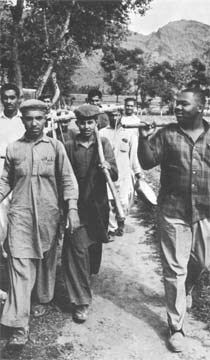 Marching along with their instructor, Willie Douglas, high school students who belong to a vocational agriculture program head for their classroom - the fields. The scene is in Katlang, a remote mountain village in West Pakistan, near the Afghan border. Gary Schaller teaches English in a small crowded classroom in Benepat, sixteen miles from Katmandu, Nepal. 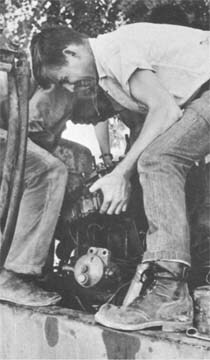 Dennis Shaner and helper repair a damaged catepillar tractor in the town of Pont-du-Fahs Tunisia, where he taught a course in diesel mechanics. 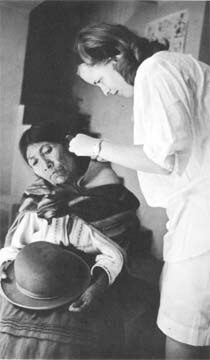 In her clinic in the town of Corioco Bolivia, Priscilla Bauguess treats an Indian woman for an ear infection. 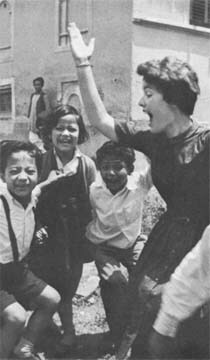 Joyce Thorkleson and her students outside the demonstration school of Katmandu's College of Education. Martha Iwaski stands in the doorway of a barriada school in the coastal city of Chimbote Peru. Peace Corps Photographer Paul Conklin at the time these photos were taken. Read why Senator Norm Coleman is a strong supporter of Bush's full $359M budget request but wants greater accountability from the Peace Corps. 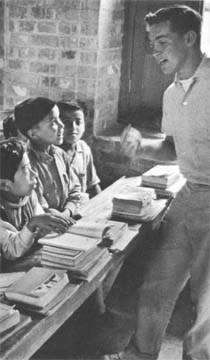 Sargent Shriver's Fourth Goal for the Peace Corps and his call for an enterprise that is vastly improved, expanded, and profoundly deeper. 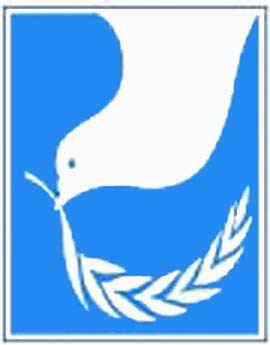 See if you can guess how many Returned Volunteers there are in the top 21 senior staff positions (political appointees) at Peace Corps Headquarters. I was an early volunteer '64 to '66 . Located upcountry in Sierra Leone, I was the volunteer leader for 14guys doing Rural Development. As an architect I was able to design and get constructed several buildings, including schools, clinics, and hospitals. One school was published in a architectural mag in the u.s. Much of the work was in Cinva-ram block construction. Haven't been in touch with other volunteers since then. But was prompted to connect when reading about Paul Conklin's death. He spent a week with me and took tons of photos of the guys and myself. His photo of me with a young boy on my shoulders,became a book cover and on recruiting information for a time. Great guy and enthusiastic about his work. The time in the PC was indeed the toughest job I've ever loved. Thanks for listening. Is there a way to reach out to my former volunteers there at the time?